Thousands protested the not guilty verdict Friday. At least 18 people were arrested in Minnesota overnight during a protest that shut down a major highway, following the acquittal of the police officer who fatally shot Philando Castile. 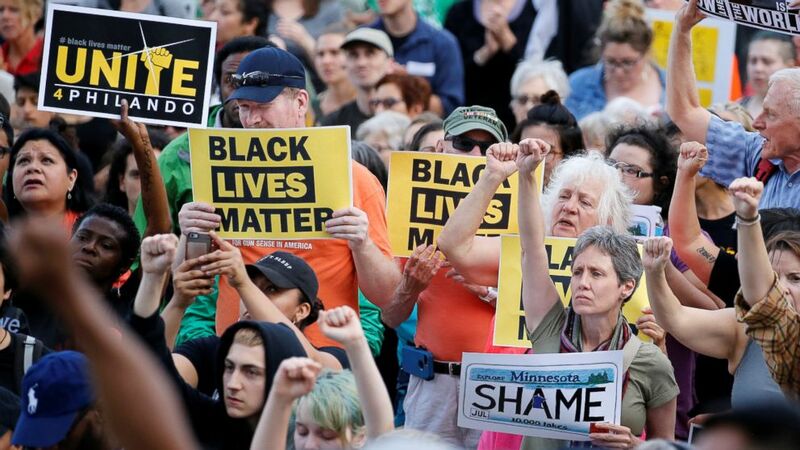 Thousands of protesters gathered at the Minnesota State Capitol and marched through the streets of St. Paul on Friday night to decry the not guilty verdict returned by a jury in the manslaughter trial of former St. Anthony police officer Jeronimo Yanez. An estimated 2,000 people participated in the march, part of which shut down a major highway, according to the St. Paul Police Department. Yanez, 29, shot Castile, 32, multiple times on July 6, 2016, seconds after the black motorist alerted the officer that he was carrying a gun, during the traffic stop. Castile had a permit for the weapon. Yanez, who is Latino, was charged with second-degree manslaughter. The mostly-white jury deliberated for some 29 hours over the course of five days this week before reaching the not guilty verdict. After the verdict was read Friday afternoon, the city of St. Anthony swiftly announced plans to dismiss Yanez, despite his acquittal. City officials said they would offer him a “voluntary separation” because they had determined “the public will be best served” if he is no longer an officer in St. Anthony. (Stephen Maturen/Getty Images) Protesters pack the steps of the Minnesota State Capitol building on June 16, 2017 in St Paul, Minn. Protests erupted in Minnesota after Officer Jeronimo Yanez was acquitted on all counts in the shooting death of Philando Castile. Friday’s march remained largely peaceful. Seven people were arrested during the massive demonstration near the state Capitol and no injuries were reported, according to the Minnesota State Patrol. But as darkness fell, a smaller crowd splintered off from the march and walked down an entrance ramp to block Interstate 94. An estimated 500 protesters snarled traffic and forced police to shut down the freeway in both directions, the Minnesota State Patrol said. Police ordered the protesters to disperse and the crowd eventually moved off I-94 mainlines and onto an entrance ramp. By early Saturday morning, at least 18 people had been arrested for failing to leave the freeway. They were booked at Ramsey County Jail, according to the Minnesota State Patrol. 18 persons were arrested on the freeway. They will be booked at Ramsey County. Castile’s fatal shooting was among several cases around the U.S. last year where law enforcement officers were found to have killed blacks. His death captured national attention when his girlfriend, who was in the car with her young daughter, streamed the aftermath of the shooting live on Facebook. Castile was one of 1,092 people killed by police in 2016, Teresa Nelson, interim executive direction of the American Civil Liberties Union of Minnesota said. During the trial, Yanez testified that Castile was pulling out his gun from his pocket despite his commands not to do so. The officer’s defense team also argued Castile was high on marijuana, which affected his actions. Prosecutors argued that Yanez did not see the gun and acted unreasonably. They contended that Castile was not a threat. Castile's family claimed he was profiled because of his race. "The fact in this matter is that my son was murdered, and I'll continue to say murdered, because where in this planet [can you] tell the truth, and you be honest, and you still be murdered by the police of Minnesota," his mother, Valerie Castile, told reporters after the verdict, referring to the fact that her son was shot after he was heard on squad-car footage of the traffic stop telling Yanez, "Sir, I have to tell you, I do have a firearm on me." 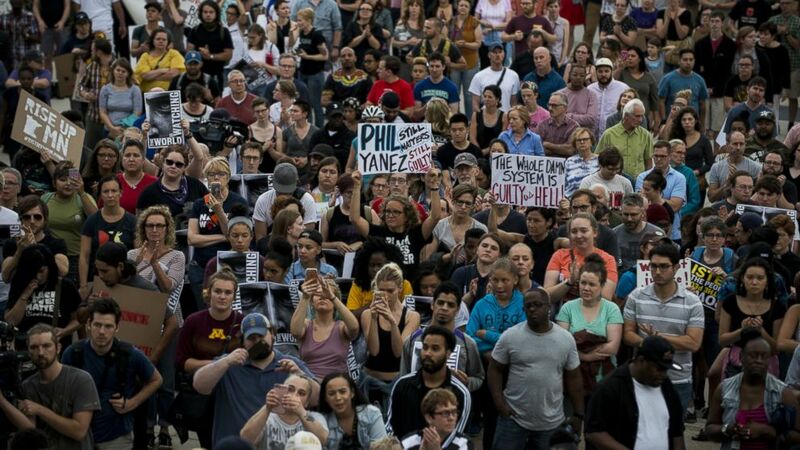 (Eric Miller/Reuters) People protest in support of Philando Castile during a rally on the capitol steps after a jury found St. Anthony Police Department officer Jeronimo Yanez not guilty of second-degree manslaughter in the death of Castile, in St. Paul, Minn., June 16, 2017. Castile's girlfriend, Diamond Reynolds, said she is "incredibly disappointed with the jury's verdict." "It is a sad state of affairs when this type of criminal conduct is condoned simply because Yanez is a policeman. God help America," Reynolds said in a statement Friday. St. Paul Public Schools, where Castile was employed as a cafeteria worker, described him as a "beloved employee." The school district said grief counselors will be available to speak to students and staff. "This is a tragedy that impacts many people and lives in our community were forever changed," St. Paul Public Schools said in a statement. Meanwhile, St. Paul Mayor Chris Coleman described Castile as a "son of Saint Paul." "As people across our city, state and country react to the jury’s verdict, I urge each of us to move forward in a way that is peaceful and respectful of everyone –- residents, demonstrators and police officers alike," Coleman said in a statement Friday. ABC News' Julia Jacobo, Emily Shapiro and Jason Volack contributed to this report. The Associated Press contributed to this report.